Welcome! We very much look forward to helping you plan your beautiful day! The links below contain the information and documentation you will need. Due to a large number of requests for weddings at the Basilica, we will consider only requests from couples who have some connection to our parish. For planning purposes, the Basilica is not available for weddings on the second Saturday of the month from August to May due to hosting a diocesan program on those Saturdays during those months. 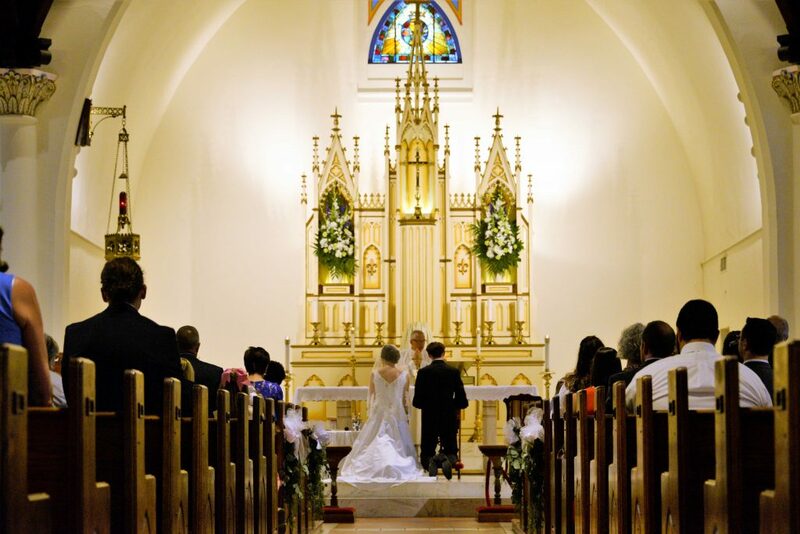 After carefully reading the Wedding Guidelines, please contact our Wedding Coordinator, Mrs. Linda Wulf, who will be happy to answer your questions and guide you through the next steps, including how you can reserve a specific date and time for your wedding at the Basilica of St. Michael. Contact Linda at: 850-602-6946. The Diocese of Pensacola-Tallahassee requires certain specific documentation before a wedding can take place. You may use the Document Checklist to assist you in securing these important documents. And finally, once you have spoken with Linda, you are welcome to print out and complete the Wedding Contract. No date is confirmed until the couple has met with the Wedding Planning Team and the contract is returned with the requested deposit. Dates are set within a nine month window of the considered date.